Memes may seem like a modern day invention; the idea of a random image or video that is often bizarre, making its rounds around the internet and infiltrating public consciousness, but in fact, memes are far older than that. 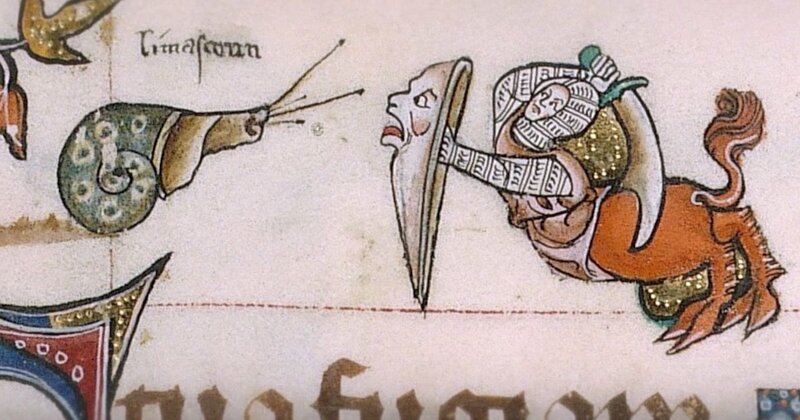 If you think weird memes about Spongebob Squarepants are weird, then you haven’t seen some Medieval English manuscripts, which are actually filled with doodles of knights fighting snails. 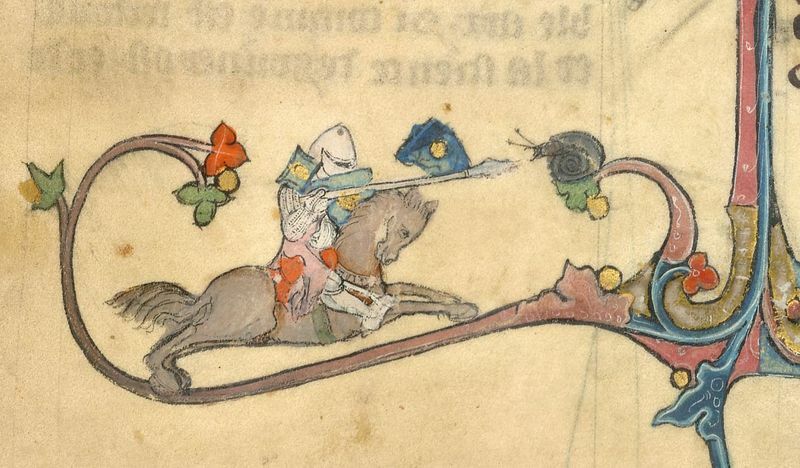 In hundreds of 13th and 14th century manuscripts, there are illustrations in the margins, above header and below footnotes of knights charging into battle against the mighty snail. And not just one type of depiction either. We have knights defending themselves with a shield (made out of a face), knights fighting them with a sword, fully armoured knights literally using a horse to charge them down, and in what must be the weirdest one, a knight transforming himself into a half dragon to fight a snail. Even today, there is no definite theory on why different authors across that time period decided to draw this bizarre mismatched fight. There are theories that snails might represent a aristocratic medieval family, or that weirdly snails represent death, and that the knights represent the eternal fight against the coming of the night, but it may well be that it was just funny to draw knights beating slimy little animals. Possibly the only defence that any of these snails put up is occasionally turning themselves into a cannonball peashooter, but even then, it seems to have very little effect, given that they are snails, and that this is biologically impossible. HSPS, and Archeology and Anthropology students can look into how human depictions of certain acts have changed through human history. History of Art students can look at what constitutes art and what constitutes doodling.